A 99-year-old resident of Lichfield, West Coast Berbice was badly beaten around 8 pm on Friday last when a bandit broke into his house and robbed him. Layne said a shirt which had $14,000 in its pocket and which he had hidden under his pillow is missing but he could not say what else was stolen. He said he later made a report at the Fort Wellington Police Station and was told to go the Weldaad station but he did not have the energy to do so. 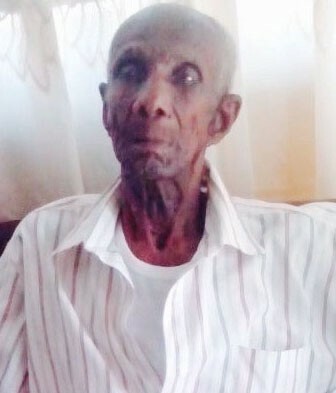 Layne who will celebrate his 100th birthday next year March lives alone and does his shopping, cooking and cleaning on his own. His nephew, Lincoln Lewis of the Guyana Trade Union Congress told this newspaper that he was on his way home from work when he received a call about the attack on his uncle and he headed straight there. On his way he stopped in at the Weldaad Police Station and reported the robbery. The officers initially told him they had not heard about it. He advised them that a report was made at the Fort Wellington station and that the name of the suspect was provided. They then tried unsuccessfully to contact that station by phone. According to Lewis, this has been “happening over a considerable period… They’re fetching valuable items out of the house…” He said when he got to the house around 9.40 pm he saw the window that the bandit broke to gain entry.